I would NEVER aspire to making croissants at home. NEVER. Why bother if you can buy brilliant ones for the price of a few minutes on one’s cellphone yapping away on some inconsequential matter? The flakiness is caused by dozens of layers of dough with butter in between. It is perfect on its own, but paired with some more butter and a good jam this is one of life’s finest pleasures, in my opinion. French baguettes are also brilliant, but for me, give me a good croissant any day and it will probably MAKE my day. You got it right MM, its the wonderful french butter, the flour, the water, and the salt. But am not too sure about the salty sweat of the french baker….hahaha. 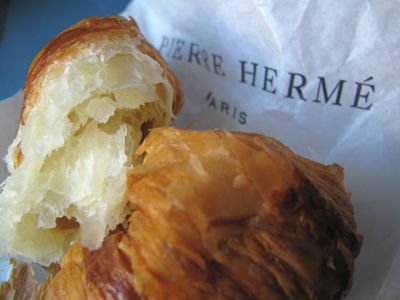 Your pictures truly does justice to the croissants of Pierre Herme. entirely different from the local delifrance croissant that I always have here…must be the flour, butter, and of course the preparation. Besides all of the above as you and AC pointed out, I think the MARBLE TABLE and technique plays an important role as well. Ok…scratch the marble table or I am asking for a “fish pan”comment…mwahahaha! Thanks for reminding me, MM! I will take out my marble table tonight and make the dough for the boys’ breakfast on Fri. Ha! Connie C…slather that strawberry jam on it till it’s dripping! But MM,why say never when you have a marble table, air conditioned kitchen…I am assuming you brought back Plugra butter from your recent trip to NY…Ergo, you have all the makings of a really good croissant. Better yet, make a huge batch and then shape into crescent and FREEZE. …So if and Mrs.MM and the Teen have a hankering for croissant for breakfast, take it out of the freezer night before, in the fridge overnight and proof the next morning….works for me!!! You are absolutely right! Even the croissants found at any random corner in Paris are better than most- and they are like air- you could eat a few and not really feel it ( until a few days later when your pants don’t fit!) Makes me think of the bagel- NYC bagels are just different- they say it’s in the water- I have had decent bagels in other cities but nothing really compares to one from New York- my personal favorite is Ess-a-Bagel, second would be H &H! I agree! I guess they still use real French butter. Most bakeries here in the Metro including maybe the US already use something called pastrex which is partially made of shortening. It is much more stable to use and does not have to be refrigerated. The is why most croissants here don’t taste like butter at all. There used to be a small bakery in Makati called Nielsen’s Baggerie(?) or something like that who used to make really good and tasty croissants. They seem to have closed down since. French baguettes are great too in any corner with minimal packaging but a piece of paper where you can hold it. Yes, New York bagels are best in New York too. Must be the water. Ang sabi po ni Pierre ay hindi lang po daw ang kalidad at tamang kombinasyon ng mga sanggkap ang mahalaga kung hindi pati na rin ang tamang pagpapahinga ng masa (para bang steak) bago ito isalang sa pugon. Salamat MM at masubukan nga itong croissant na ito sa susunod na paglakbay ko sa Paris. Here in the Lower Mainland there is a bagel joint called Siegel’s Bagels that can compare to any New York bagels. I don’t think they would IMPORT New York water?!? I used to drive 30 minutes ( this is freeway driving and not city driving!) just to buy their bagels! Lex: Yup, most likely you are talking about the high ratio shortening…more cost effective! That is why I will never make it rich if I open a pastry shop for I have this thing about quality control! …right Artisan? salty sweat…hahaha—-artisan choc, that’s what they used to say about the delicious, authentic chinese siopao…yummy croissant!! You should try croissants in Japan. The best French bakeries in Japan blow pretty much any American French bakery away, and they come pretty close to the quality of French bakeries, I’ve been told. And the macarons! I’ve done taste tests of macarons including JP Hevin, Pierre Herme, Sebastian Bouillet (sp? ), and some Japanese bakeries, and the winners were two Japanese bakeries (Chez Cima and Henri Charpentier). But that was for caramel macarons only (other flavours have different results, but Japanese bakeries rank very highly). 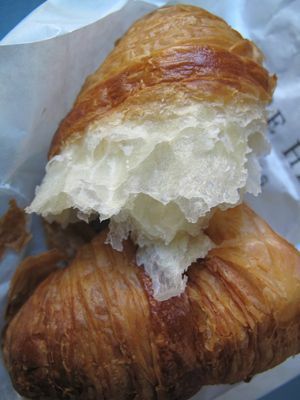 I never understood the hoopla over croissants until I had one in Paris. I swear I heard angels singing, lol. Ah, the perfect croissant! For me, the messiest ones to eat are the best. The crust should explode into a thousand flakes as you bite into it. Same for pain au chocolat. in SF, Tartine Bakery makes the best croissants in the countryâ€”they say. baked nicely brown and crisp almost on the verge of getting burnt. 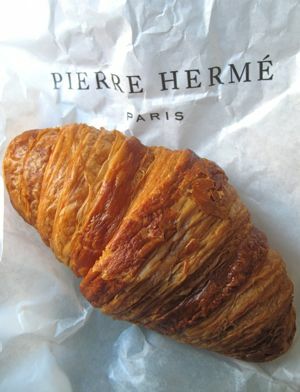 moist inside, crisp and flakey outside and leaves a good butter grease stain on the paper bag – like french croissants. Without a doubt, PH’s x is the best. It blew my head off. Then I nearly died when I had the Ispahan croissant. I am totally with you on the croissant! I also like Laduree’s and Lionel Poilane’s (both baguettes and croissants). Sadly, I haven’t found its equal here in Toronto. It’s the butter content, y’all. Too bad, everything stays on your waist. there is a pastry shop not too far from where we live that offers the best fresh french croissants that they bake daily, among other pastries. just one croissant and good coffee in the morning to wake me up….i can live with that!!! I lived on bread during our short stay in Paris. This post brings back memories. Thanks, MM! H&H Bagel from NYC rocks for me!!! jtan, try the croissants made by bouchon of Thomas Keller in Yountville (Napa Valley). They are as close as the ones from Paris. BettyQ, Lex…Yes, The french butter and the soft french flour really plays a major role in making awesome croissant. As Artisan Chocolatier and BettyQ revealed the secret of French Baking techniques, another one I heard is the use of brick wood burning oven. For efficiency gas burning oven is reliable but for authenticity brick wood burning oven is the number one choice of the pros. With the EPA bureaucracy you cannot find a lot of brick wood burning oven in the West. From what I read on the paper, it took Nancy Silverton and Mario Batali two and a half years to comply with the federal regulating body EPA and the local Building and Safety Department in Los Angeles to open up their Mozza Pizza Place. The restaurant construction was a breeze for them but the set back was the brick wood burning oven. Nancy was about to walk out of the project since she will not go for any other type of oven to bake their pizza but her patience paid off. Mozza is one of the pizza landmarks in the US. alicia, I discovered a truly great thing about a trip to Paris: I could eat all the croissants, baguettes, pain au chocolat, and chevre I wanted and I still LOST WEIGHT because I averaged 4-6 hours of walking everyday. Navigating the metro by itself requires a great deal of trudging up and down stairs. And because the pastries and breads use topnotch ingredients and are accessible everywhere, you don’t have the urge to gorge on them. I was happy with a bit of this and a taste of that. Speaking of bread, a month ago a friend hand-carried baguettes for me on the plane from Paris to Manila. She picked by sheer happenstance one called “la flute gana” whose boulangerie, as it turned out, takes deserved pride in its history, flour, and technique. Expectedly, the baguettes were limp upon arrival but I stuck them in the freezer and they retained their freshness for 2 weeks. Truly spectacular when toasted, with a crusty exterior, and chewy, hole-y, nutty innards. That looks mighty fine! Actually, croissant isn’t hard to make. It just takes time. I’ve made decent croissant in about 6 hours total, but a real good one takes much longer since the dough has to rest before adding the butter and after every turn (ie. adding an additional layer). Man, the exterior of that croissant looks great! Makes me want to make some again. Am no Francophile but the French do know their bread–not just croissants…as breads should be: not sweet (sweat?!?). drool, you can actually see the layers on the inside and out of this croissant! Yes, I truly agree with you the French really know how to make the best breads. That croissant in the picture really makes my mouth water, I’m sure its great and soo good.. tsk, tsk if only its available here! It is deplorable that we don’t have excellent croissant places in Manila. It really is such a beautiful thing to wake up to in weekend mornings. Nice post MM. I love croissants and like you, I also love bagels with shmear and lox and I like the bagels from Noah’s Bagels. To Ubs: I would love to make some croissants myself but don’t know how. Do you mind sharing your recipe? If it’s a secret, it’s okay. Thanks. Lilibeth: points to remember in making croissant…wait till the weather gets a bit cooler like start in early morning or at sundown. It is important that the dough and the butter is sort of the same temp. If the butter is hard when you layer them in between the dough for the first turn, then it will be bumpy and might tear. Preferably keep it cold ..THE DOUGH IN BETWEEN TURNS! I have used Bernard Clayton’s recipe ever since (20 years?) and it works for me….flaky!!! Also, Mr. Clayton notes that as you are producing the layers by doing the turns, it is vital that there is little rising during the process…meaning if the dough is made to realx while you are turnng and folding for more than 15 minutes, put it back in the cooler so the yeAAST DOES NOT HAVE THE CHANCE TO RISE. Unlike making tinapay, kneading as little as possible works best for croissant. …stop when the dough is a smooth ball. Do not over proof the first rising so as not to give the yeast an opppotunity to eat the sugars in the dough. Otherwise, it will not be as sweet. Butter ….of course wins hands down, for taste and texture as in softer and longer shelf life than those made with margarine BUT…the BIG BUT is margarine produces a much more flaky croissant and works best for the baker. So commercial bakers use half butter and half margarine! While in teh cooler, always have it covered with a moist cloth or plastic wrap. You don’t want a skin formng. Now are you familiar with making puff pastry or danishes? It is the same thing …making the layers by rolling, and folding like a letter at least 3 times. If you are, then I don’t need to put the turning procedure in detail for it is quite long! If oyu aren’t familiar, then let me know and I will post it separate! Ingredients : Before I start, I make 2 batches so I can freeze the rest. BettyQ: Thank you so much for your generosity in sharing. I have never done puff pastry or danishes. I only bake cakes, pies, and some bread. When you say puff pastry, is it the one used for baklava (one of my favorite desserts)? It seems similar to baklava where you also add butter in between the layers. Is the folding like a letter similar to kneading and if so, can I use the mixer’s dough hook for this? Thank you so much! Oh, I cannot believe this! I am so sorry Lilibeth, I guess I was in a hurry to take my son to work I didn’t even wait till I checked the reply,,,got cut off again! Let me continue the reply first:OK? so gong back…knead very briefly the dough until just no lumps. Put in bowl, covered with towl or plastic wrap and let it proof for about 1 1/2 hours. Meanwhile. again…butter same FIRMNESS and consisitency of dough…so using a putty knife, work it into a rectangle6 x 8 inches and 1/2 inch thick. Let it sit in cooler if too soft and sticky. Layering: COOL KITCHEN! Rollout the ball of dough to rectangle 10 x 12. If it pulls back, rest (not you! but the dough) for a minutes so it relaxes! Now put the butter occupying the lower 2/3 of the rectangle…REMEMBER: SAME FIRMNESS AS THE DOUGH! then fold the upper third over the middle third and gently lift the bottom hird and fold it over the middle…so you have dough, butter, dough, butter , dough! TURNS: Roll the dough now into a rectangle again 6 x 12 inches , 1 inch thick. Fold in thirds like a letter. This is your 1st turn. Let it rest 10 mi utes. REMEMBER: AS LITTLE TIME AS POSSIBLE FOR RESTING AT ROOM TEMP> So chill in cooler if kitchen is getting warm. Do this rolling and folding 3 more times for a total of 4 turns including the butter incorporation. BY then you will have a total of 55 layers!…REMEMBER to let it sit briefly in cooler . You don’t want to let it rise yet! After the 4th turn, let it chill in the cooler wrapped or covered for 1 1/2 hours. Shaping: Roll dpough into reftangle 24 inches long and 10 inches wide. Cut into 2 strips, 5 inches wide each. Cut each strip into triangles 5 x 5 x 5. Working 1 triangle at a time, put the others on sheet and refrigerate. Roll the triangle witha rolling pin starting form the base to the apex. Roll from base up the apex giving it a very slight pull as you are rolling up. Now, the tip is usuaaly at the center of the crescent and not tucked underneath giving it a chance to rise. NOw, FREEZE THE ROLLS AT THISSTAGE if you made a lot. …single layer on a cookie sheet and FREEZE> Pack in zip plck once frozen. Proof for about 30 mi utes or so, giving it eg wah three times…right after shaping on trays. …halfway proofing, and then right before it goes on 400degrre oven. Bake . You cna freezethem too after baking….cool thoroughly and pack . PHYLLO DOUGH for BAKLAVA…This is the dough in the whole wide world that I will never attempt to make. Even my Greek friends won’t! Why? it costs only $2 something cents to buy a whole pack( on sale). Now, croissants on the other hand costs over $2.50 for 1!!!! So, mahina ang tatlo for each of my boys for breakfast esp. if it is fresh baked. That is why, I make my own, freeze them, let it defrost in cooler overnight, next morning, proof and bake before they wake up! So phyllo is not the same as puff pastry and danishes. Danishes, similar to croissant in that it has yeast whereas puff pastry doesn’t and doesn’t need proofing. If you want danish recipe, I have an excellent one too and also puff! FOLDING like a letter not at all similar to kneading. Folding is ROLLING THE DOUGH INTO RECTANGLE first nad then fold like a letter. NO KNEADING INVOLVED! Kneading is only the first portion up above when you incorporate the yeast to the flour like bread making. But you don’t need a mixer. REMEMBER POINTERS UP AT THE START:>>>the less you knead, the better you are not tryong to develop the gluten unlike in pan de sal…you have to develop the gluten! Got it! Just wanted to know how long do I bake it? Thank you very much! Since it is a hot preheated oven, check after 10 minutes. If you plan to freeze baked ones, (which works as well cutting down your time in half for future eating… this is the stage you take it out…not quite golden brown. So that when you reheat it, it will turn to a nice golden color …just right! Othrwise, continue to bake for another maybe 2 minutes or so till it’s nice and golden. For croissants, I don’t like it anemic looking! REMEMBER: DO NOT ATTEMPT TO DO THIS IN HOT SUMMER WEATHER! A nice cloudy day when it is waaaay cooler works best …better yet in the fall or winter. In this weather though, best to wait and start this in early a.m. or nightitme. In my apprenticeship days, we made the dough early a.m., refrigerate. It stays there until the night time bakers come in and finish making the croissants. So, in a way, you can do up until the last turn, and refrigerate. Next morning, continue and start the shaping process. But if you cannot wait and must simply do this, keep on putting it back in the cooler and handling it as little as possible in between turns. Hey, Sanojmd and dragon! It is winter where you are…perfect weather to do this! I always have the airconditioning on now that it’s summer and we keep the thermostat at 73 degrees. Is that cool enough? Or do I still have to chill the dough because I don’t really have that much space in the fridge. Thanks. betty q, is there a noticeable difference between using a combo of bread and AP flour vs just AP flour? I’ve always made my croissant using a combo but perhaps using just AP flour would yield even better results. Also, what do you think is the best % of butter to flour? Ideally, 70 degrees or less is good…doing the turns with minimum time in the cooler. Anyway, 6 x 12 is not that big! It is only slightly wider than an egg tray. The 4 turns you can do in about 30-40 minutes…not that long! 70 to 75 degrees is about room temp. so you ight just need to put it in cooler for just 10 minutes or so to firm up the butter and dough if it is getting soft. This recipe, Lilibeth, is from Honfleur as stated by Mr. Clayton. The bakery is owned by one of the master bakers of France..MOnsieur David. Another reaaaaaly good one is from SS France also in Mr Clayton’s book. Since I already have introduced you to the folding and turning technique, here is the recipe of SS France….more buttery since it has 1 pound of butter for 8 cups of flour. If you are not too worried about the butter content, DO THIS ONE! Mr. David’s yields 18 extral large pieces whereas for a little over 8 cuips of flour from SS France’s recipe yields 3 to 4 dozen petite ones. Remember: this is served on a cruise ship so they make them fairly small. Same procedure up above. But no machine kneading…only by hand and if it too large to manage, divide the dough in half and work it using your hands and scraper briefly. Dough is sticky and soft. REMEMBER: DO NOT KNEAD! So I generally let it rise in the cooler. Dough: first rolling..roll into 8 x 20 in. rectangle. Place butter in again lowet 2/3 of dough leaving 1 inch border so as to seal it without butter oozing out. Then fold like a letter. Turn the dough so open ends are at 6 and 12 o.clock…roll into 12 x 36 rectangle making sure butter does not ooze out. Fold like a letter, turn it around …roll again and fold like a letter agin. Wrap dough in damp tea towel wruing f=dry and palce the package on cookie sheet and palce in cooler 2 hours. 3 and 4th turn: unwrap the dough, and roll and fold three….roll and fold three again. Wrap tightly with damp cloth to reastrain rising and place in cooler overnight. Next day…shaping: roll dough rectangle 10 inches wide, 44 to 48 inches long about 1/4 inch thick! Trim to make a strip 10 inches wide. Cut into triangles 5 inches wide like the first one. Should the butter soften, place pieces in cooler whle wortking one piece at a time shaping it. There you go! This is the recipe I use when I am not pressed for time and I want to make for abig crowd and make sandwiches out of it. But for the boys’ breakfast since they are big eaters, I use the other one. But try both and freeze some! I guess I’ll try this more buttery one first and stay in the gym longer :). I really love the taste of butter. I have not seen non fat dry milk though. There is dry milk like Klim and Nido in the Filipino store but it is full cream. Also, when do I put the milk in both recipes. It was not mentioned in the first one. Sorry to ask so many questions but I am just a home baker. Thanks. Yeah…BUTTER RULES! In grocery stores here, nonfat or skim milk powder available even bulk. Since we drink skim milk or 1% for me and 2% for the boys, I don’t stock up on milk powder. So, buying in bulk bins is ideal! The milk in both recipes is added to the dry ingredients in the bowl together with the yeast (frothy by now). This is what you call straight dough method…unlike the ensaymada wherein you have the sponge (lavadura) and the dough portion. OK…I am confusing you now, aren’t I? Adding full cream milk powder only increases the percentage of the fat content of the dough producing a more tender type of dough. But this has nothing to do with the flakiness which is achieved by the layering and the firmness of the butter so when it is subjected to heat, the moisture in the butter causes it to puff and layering and flakiness is achieved!again…maybe spend 2 hours in the gym? But if you use skim milk powder, maybe just 1 hour? WOW BettyQ, you are so amazing, typing out everybit of instructions…truly a labor of love. No surprise why you are so blessed!!! I would have just link them to some site…hehehehe…lazy me. Hey, BettyQ, have you tried making croissant dough where the butter is on the outside? AWESOME!!! Funny thing is the best croissant I’ve had so far was from Vietnam (District 1, Saigon) provided I haven’t been to France (been to Euorope and South American, much of Latin America and South East Asia). Can’t wait to have a try on those babies in Paris. BettyQ: Thank you so much for your patience and typing out every bit of information like Artisan said. I will try making it this weekend or the weekend after. Again, thank you very much from the bottom of my heart. You are just as generous as Marketman. God bless. hi i would like to ask where to buy a pastrex here in the philippines? tnx so much!! Care to Guess What This Is?? ?